Jan 2013, Bethlehem suburb, Industrial zone. Initiated with the support of the French president Nicolas Sarkozy in order to support the Palestinian economy, the idea was to create a free zone for national and international investors, where the import and export would be facilitated thanks to privileged conditions negotiated with Israel, exempting the raw materials of import taxes and facilitating the passage of camions at the checkpoints. 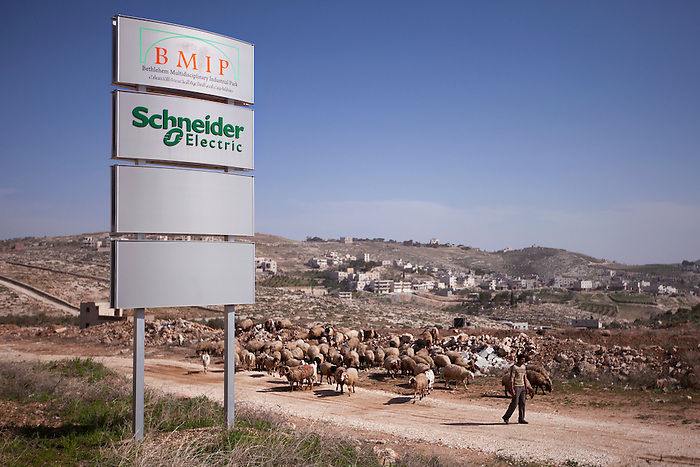 With only one Palestinian investor so far, the BMIP, company in charge of developing the zone, is struggling with little success to convince companies to move in the industrial zone. Out of the three projects of industrial zones in Palestine, it is however the less unfortunate one: it has the advantage of being the only one in the A zone, the 16% of the West Bank that is not under the control of the Israeli army. Even though, a small piece of the main road that would give access for camions is still under the control of the Israeli army, and so far didn't get the permission to be built, blocking the development of the zone.